Northants men have won the Liberty Trophy for the first time in their history. Competing in their first-ever final of the most prestigious of men’s inter-county national team championships, the county claimed a dramatic 110-107 victory over two-times winners Lincolnshire in an outstanding match at Melton & District IBC. With a number of international players on show, a narrow affair was expected but no-one could have predicted the close finish that ensued. The early ends were even with Lincolnshire holding an overall lead of 31-24 after five ends. From then on, there was very little between the two teams and, with 60 ends to play, Lincolnshire were 59-58 up, although it could have been much worse for Northants had Vernon Gearey’s rink not picked up a count of seven shots on the 11th end. Lincolnshire extended their lead to 91-80 with 28 ends to go but Northants battled back with some excellent scoring. There was a count of eight shots from Neil McKee’s rink while Paul Broderick’s enjoyed an 8-2 win to ensure the overall score was 100-99 in Lincolnshire’s favour. The last few ends proved to be very tense on all rinks. The key moment arrived when Broderick’s rink picked up three shots on their last end. That put the county in front by two shots with just one end to be completed by Mick Sharpe’s rink. That end was well played by Callum Height, at lead, Andy Smith, at number two, and number three Andrew Manton and they held three good shots until Billy Jackson sent down a rocket, which killed the end to ensure it was replayed. But the county supporters didn’t have to worry. Height, Smith and Manton again played superbly to ensure that Jackson had to go on the attack once again. This time, his firing shot sent bowls all over the place and he sat on one shot, albeit quite a way from the jack. Sharpe, who had put a back strategic bowl in with his first, and anticipating an attacking shot from Jackson, calmly drew to the jack. Jackson then almost stole the shot as he sent a trailing weighted bowl which caused the jack to move. But Sharpe’s first bowl remained as shot and that sealed a thrilling victory for the county. The delighted players were congratulated by county president Trevor Tilley and they were presented with the trophy by English Indoor Bowling Association chairman Arthur Broadberry. Rink one: David Love, Ben Sharpe, Jim McKee, Vernon Gearey 22 Jordan Philpott, Andy Dawson, Ashley Caress, Matthew Orrey 19. Rink two: Mark Corbyn, Bob Fuller, Phil Exley, Neil Corbyn 13 Kevin Rands, Alan Watts, Dean Stevenson, Danny Brown 22. Rink three: Dave Flippance, Jason Bryan, Connor Cinato & Neil McKee 16 Ron Flowers, Calvin Leuty, Scott Dunham, Paul Simpson 15. Rink four: Callum Height, Andy Smith, Andrew Manton, Mick Sharpe 17 Adrian Field, Martin Pulling, Dion Auckland, Billy Jackson 20. Rink five: Richard Lemon, Chris Bland, Darren Childs, Jamie Walker 18 Matt Whyers, Gary Morris, Jonathan West, Graham Smith 17. Rink six: Matt Pownall, Dominic Graham, John Haines, Paul Broderick 24 Rhys Hill, Nick Orrey, Simon Lilley, Martin Spencer 14. THE Wellingborough team of Callum Height, Paul Broderick and Jamie Walker narrowly missed out on the National Triples title as they were eventually beaten in the final at Melton & District IBC. They started with a 13-11 victory over Robert Elmore, Greg Harlow and Nicky Brett (City of Ely). There was little to choose all the way through a high-quality match and it was won when Walker gave his team a one-shot lead going into the final end, in which he also drew the winning shot. That set up a quarter-final clash with defending champions Matt Whyers, Martin Spencer and Graham Smith (Spalding IBC). Wellingborough led by six shots going into the last two ends, but Spalding picked up two on the penultimate one. At one point in the final stage, Spalding had four shots, which would have taken the game into an extra end, but Walker fired and was able to remove one of the bowls to secure a narrow 18-17 win. The tight games continued to come and the Wellingborough trio again won by just a single shot in the last four as they edged out Ken Chedgzoy, Tom Millership and Andrew Walters (Welford-on-Avon IBC) 16-15. This time, they had to come from behind as they trailed 15-14 going into the last end. Height bowled three terrific bowls and Broderick put his just behind. It came down to Walker’s final bowl and he produced one with the perfect weight and line to get through a small gap and there was enough movement of the jack to collect the two shots needed. 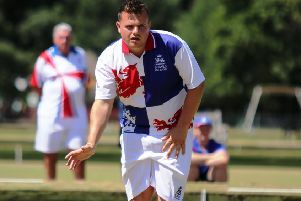 It all made to set up a final showdown against Cyphers IBC’s trio of Paul Field, legendary bowler Andy Thomson and Tom Doig. The scores were level at 6-6 after five ends and Cyphers held a narrow 8-7 advantage after eight before the teams were all-square again with seven ends to play. Cyphers played with a bit more authority to take a 17-14 lead with three ends to go but then disaster struck for Wellingborough when two fired bowls from Walker didn’t go his way and resulted in the opponents picking up five shots. The county trio picked up one shot on the 17th but were forced to conced with one end to play at 22-15. Despite the loss, it was a fine effort to reach that stage. Broderick was also involved in the National Fours along with Mark Corbyn, Darren Lyman and Neil Corbyn. However, they were beaten 26-15 by the Torquay United IBC rink of Lloyd Roberts, Ian Lesley, Ryan Whitlock & Louis Ridout in the first round. In the National Singles, Desborough’s Matt Pownall suffered a first-round exit at the hands of England international Ashley Clipston, who claimed a 21-15 success.